mommy's reviews: Laguna Pearl...Makes Me Feel Like A Lady! I have always LOVED pearls. From the time I was a child I always admired their classy, elegant and luxurious look. My grandmother wore pearls all the time and she truly was a fashionable woman. So, when I was married I knew that if I ever wanted my own set of pearls, I would have to drop subtle hints to my hubby. He is NOT a jewelry buyer, unless he knows I like something specific. In 2008 I was expecting our first baby. It was such a special year and I knew that when you have a baby finances can become tight so before my birthday I began to drop subtle hints to my hubby. Hints like "I have always loved pearl necklaces", and "I would really like to own a pearl necklace someday...this one is nice!!" (pointing in a jewelry case at the mall). Wouldn't you know it? He got the hint and on my birthday, he presented me with the most gorgeous necklace I had ever seen!! It is a whole string of pearls and looks soooo stunning. I feel like such a lady when I wear my pearls...a true treasure to be passed on to my daughter some day! Laguna Pearl was created as a result of the public demand for high quality pearl jewelry at competitive pricing. With our roots as a wholesale pearl jewelry operation, our organization has strived to cut out the middle man and sell directly to the retail jewelry consumer. As oppose to selling pearl jewelry products to retail jewelers who mark the prices up 2 to 3 times their cost, we have built our online business by passing on the savings directly to the consumer. Our ability to customize any product on our website as well as be the leading source for custom orders of pearl jewelry on the internet is a testament to our vast platform and history of expertise. From our inception, Laguna Pearl has continually thrived on providing high quality pearl jewelry products with the best customer service on the internet. With locations in both Beverly Hills and the Los Angeles jewelry district, we have dealt heavily with surpassing the expectations of our clientele. Customer satisfaction is of utmost importance and we hope that every customer returns to Laguna Pearl for all their pearl needs. I love the fact that they can customize their products...that really gives consumers like me tons of options! I also really love the colored pearls...those are soooo stunningly gorgeous! I wore a necklace with imitation pearls on it for my wedding day and they were pink and really added some lovely color to my ensemble that day. 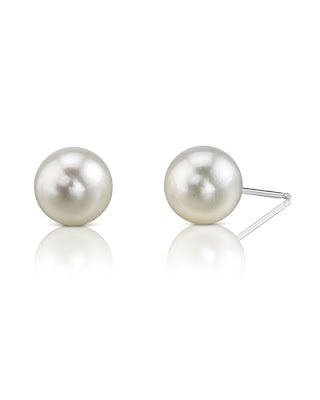 For this review I was sent a pair of White Akoya Stud Pearl Earrings. Upon receiving my package I was delighted to find them boxed in a red box with gold around the edges. To me, packaging is everything...especially if you are getting them as a gift for someone. The earrings themselves are beautiful. They are larger than what I expected too. When I wear a stud, I want it to be seen, you know? I hate wearing microscopic earrings that are difficult to see. These definitely are the perfect size for me. They are 6.5 - 7.0 mm. Another thing that I love about these pearl earrings is that the backs fit securely. I hate putting on earrings when the backs feel loose. Worrying about losing them is NOT a good thing. The post on these particular earrings are white gold as well. "THIS DOCUMENT CERTIFIES THAT ALL AKOYA CULTURED PEARLS USED TO CREATE THIS PRODUCT ARE GUARANTEED TO BE 100% NATURAL PEARLS DIRECTLY FROM THE PEARL FARMS OF JAPAN. THESE PEARLS HAVE NEVER BEEN DYED OR TREATED IN ANY WAY, SHAPE OR FORM. LAGUNA PEARL CERTIFIES THAT THE PRODUCT RECEIVED REPRESENTS THE FINEST IN PEARL SELECTION, HAND PICKED FOR ITS LUSTER, QUALITY, COLOR AND CLEANLINESS." To me, this means that I have some really great earrings that are authentic and have been treated with the utmost care. It also means that Laguna Pearl is serious about their products and wants to make sure their quality shines through. These White Akoya Stud Earrings retail at $249, but you can purchase them from Laguna Pearl for just $69...which is a steal!! If you are a pearl lover or know of someone who is...these would make an amazing Christmas Gift! So, in my opinion...I could really buy everything I see on Laguna Pearl. They are a fantastic company that really knows their pearls! I love the quality, the color, value and the fit of my pearl earrings and think that they are simply stunning. (I will probably wear them every day...LOL!) I would definitely recommend this company to all of my readers...whole-heartily! Start your holiday shopping early this year and visit Laguna Pearl...they have something for every special lady in your life! Disclaimer: I received no monetary compensation for this post. I did receive a set of pearl earrings from Laguna Pearl for review purposes. All quotes and stock photos are from the Laguna Pearl website and email. All thoughts and opinions are 100% mine. Ooohhh.. I've always wanted a nice pearl necklace.. Thanks for sharing! Something about pearls says elegant & class. Maybe you'll pass these on to your daughter on her wedding day! These are gorgeous! I have a pearl necklace that my dad brought me from Mexico years ago. It is one of my most treasured pieces! pearls are so pretty, I love that triple strand necklace you posted. gorgeous! The earrings are gorgeous! They would make the perfect gift! I'm a pearl lady too! I love how they look, so classy and elegant. 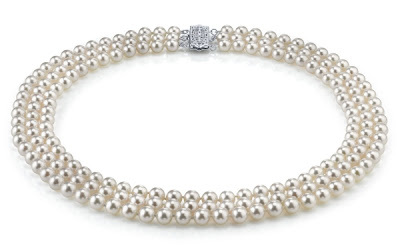 I tend to wear vintage pearl necklaces, so I have had multiple incidents where the strand has broken in public and I've been on my hands and knees picking up pearls off the ground...maybe I should get a newer, studier set like these! LOL!